Amidst my mind-numbing and constant craigslist searches, I finally found a golden nugget: An older gentleman had posted a wanted ad, asking someone to trade their standard Bonneville footpegs (like mine) for the Thruxton pair. The Thruxton is the already cafe’d model of the Triumph Bonneville, coming stock with more aggressive rearsets. These allow for a more tucked body position, great for going fast, but can be less comfortable for all around riding. This guy didn’t own a car…his bike was his car. So, I stumbled across a mod that was a free $500 addition I was planning on doing anyway. By adding the rearsets, there is an additional linkage for the clutch that has been giving me a little trouble getting back into first. I’m sure it’s only a matter of giving/taking a little slack in or out to remedy that. Forgot to get a good pic of them now that they’re on, but I did manage to snap a photo of my bike wearing the Thruxton owner’s rear cowl. I can’t wait to add one of those as well. Next move will be getting rid of the those ridiculously wide clubman bars and getting rid of the mickey mouse blinkers. 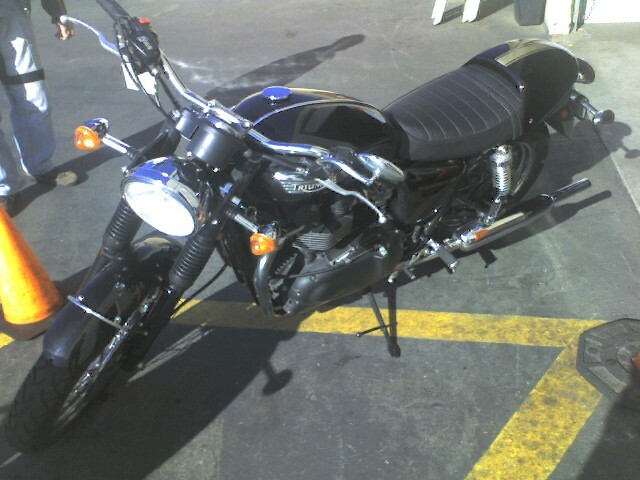 I’ve got the 2009 Thruxton bars on order and will slap them on as soon as they come. I can hardly wait…..